In 2014, Chrysler Group will drop the Jeep Compass and replace the Chrysler Town & Country minivan with a crossover, Fiat-Chrysler CEO Sergio Marchionne has revealed. The changes are part of a long effort by Marchionne to give each Chrysler Group brand a more distinct identity and eliminate product overlaps common in the DaimlerChrysler era. Brand identity is crucial for Chrysler because over 90 percent of its dealerships now sell all four volume brands: Chrysler, Dodge, Jeep and Ram. The Compass is similar to the Jeep Patriot, and the Town & Country shares many attributes with the Dodge Grand Caravan minivan. A smaller Chrysler-brand crossover will replace the Town & Country and may retain the name. The Town & Country changes mean that Chrysler -- the creator of the traditional minivan -- will field just one minivan, the Grand Caravan. In 2009 the company said it planned only one traditional minivan, then seemed to hedge that statement. 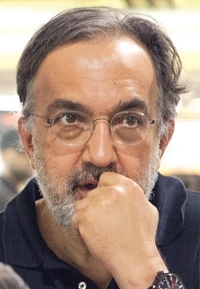 Marchionne reaffirmed the original plan. Although Marchionne is pruning models, he has been adding brands, too. Since 2009 he has introduced three to North America: Ram, Fiat and SRT. He revealed the product changes at a media event last week at Chrysler's Belvidere (Ill.) Assembly Plant and during a recent interview with Automobile magazine. -- The Compass and Patriot will continue to be built alongside the new Dodge Dart in Belvidere through August 2014. After that, Marchionne told plant employees, "There are a number of candidates to take the place of the Compass." He was not specific, and did not discuss the Patriot's future. -- Chrysler is developing an SRT version of the Dart, Marchionne said. "The only thing we're fighting over now is to determine how big an engine we stick in it." Racing enthusiasts requested a high-performance version of the four-cylinder Dart before the Dart was revealed in January. Chrysler hasn't had a four-cylinder vehicle in its SRT lineup since the Dodge Caliber SRT4 was dropped in 2009. -- The Grand Caravan will be Chrysler's only minivan when the platform it shares with the upscale Town & Country is replaced in 2014. The Chrysler-branded minivan will be replaced with an upscale crossover, Marchionne told Automobile magazine. Some media reports have suggested that the crossover could resemble the Mercedes R class. -- Chrysler continues to work on alternative powertrains, including hybrids and those powered by compressed natural gas, to meet tougher fuel economy standards. Those vehicles will be available by 2017, Marchionne said, though the automaker introduced a Ram pickup powered by compressed natural gas this year. -- Chrysler will introduce an electric version of the Fiat 500 subcompact for North America later this year and "will lose money on every car we make." Marchionne said the electric Fiat 500 is being done only to comply with requirements in California and other states for electrified vehicles and to familiarize Chrysler engineers with electric powertrains. The CEO's comments show how Chrysler continues to drop rebadged vehicles that once littered its lineup. Last December it killed the Nitro, which was Dodge's version of the Jeep Liberty. The Compass and Patriot are identical vehicles except for styling and share a platform with the now-departed Caliber. While Chrysler drops nameplates, it still seeks economies of scale by using single platforms to underpin several vehicles in the Chrysler and Fiat families, cutting development costs. For example, the CUSW platform that underpins the new Dart also will be used for the replacement of the Liberty, which is expected to be revealed in January. The CUSW platform eventually will underpin about eight small and mid-sized cars and crossovers for Chrysler and Fiat.